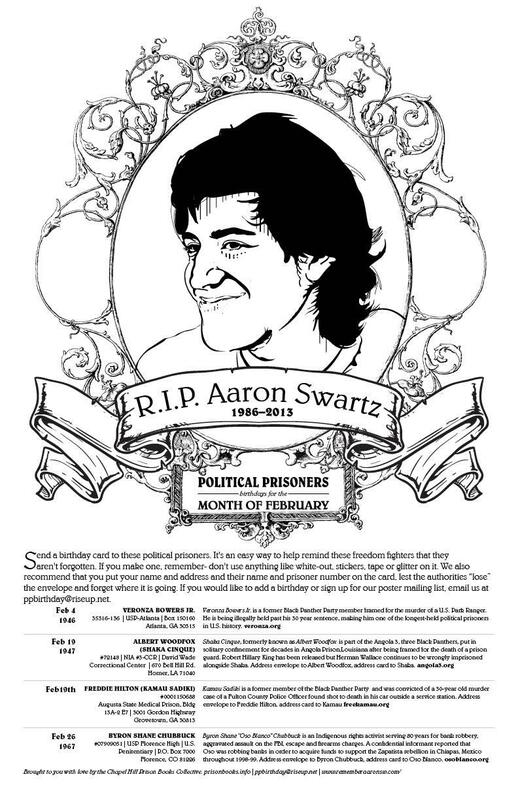 August Political Prisoner Birthday Poster! criminal racketeering enterprise has been scheduled for the mid-August. of important updates on many political prisoners. 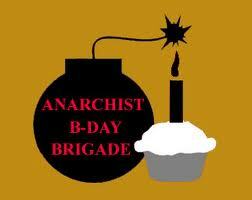 Here is the March Political Prisoner Birthday Poster from our comrades in North Carolina! Please print, and spread widely! Write letters to prisoners! If you don’t know how you can come to Richmond Food Not Bombs on Sundays during meal prep/cooking time from 12:30 to 3:30 at the Wingnut Anarchist Collective to help write a collaborative birthday letter to a political prisoner each week! to promote your local letter writing night. posted about his life and death. spreading to her lungs and shoulders. She needs immediate treatment NOW. Hey Activists! Use the Richmond Legal Support Website! Hello Fellow Activists, Organizers, Protesters, etc. ` We are writing to let you know about a resource currently being developed with the aim of supporting the Richmond activist scene. This resource is the website Richmond Legal Support (www.richmondlegalsupport.org). The website is a project of the Richmond Anarchist Black Cross, a prison abolition and political prisoner support group. Richmond Legal Support is intended to be a central point where activists from many different organizations can plug in when facing legal difficulties in order to centralize this information and keep folks from having to rebuild the wheel every time there is a protest that results in legal trouble. The website will enable people from various movements to be able to submit write-ups or information they want written up about legal issues, cases, upcoming court dates, support campaigns for the arrested, funds needed etc. Richmond Legal Support is a website created to serve as a clearinghouse for information on legal issues facing activists, organizers, and community members in Richmond which focus on civil liberties and/or social justice issues. Richmond Legal Support has also been created to provide support for the activists, organizers, and community members in Richmond who are facing legal trouble and prison due to their participation and action around civil liberties and/or social justice issues. Richmond Legal Support is also prepared to provide support to political prisoners from Richmond- helping with their cases, raising funds, and raising awareness. Fortunately, there are currently no explicitly political prisoners from Richmond. But if and when that day comes, Richmond Legal Support will be here to help. We are also looking for ways that Richmond Legal Support can offer help to people before they get into legal trouble- hopefully finding ways to link people planning activist events to legal observers, copwatchers, and hopefully even lawyers before there is a legal issue. If you would like to help run this website, get involved in a particular campaign for a Richmond legal case, offer a donation, offer your legal expertise, help organize, if you want you, your organization’s, or someone you know’s legal issue to be covered, or if you have any questions please get in touch! Thanks for all the amazing work you to do make Richmond a better place!